Extremely quirky and artisitic, this movie fits right in with director wes anderson’s new style, and strange brand of black comedy. 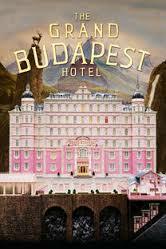 like all of wes anderson’s films, this one is incredibly artistic and filled with rich humor. this is also the closest he’s come to making an action movie, complete with ski mountain chases, prison breaks, and shootouts. call it an action-comedy. the story isn’t as great as it should have been and that’s the area that lacks more than any other. not that it’s terrible or anything, but just unimpressive. still, the humor and excitement or enough to make up for it, and the movie ends up being a lot of fun. The Grand budapest hotel is unquestionably wes anderson. like tarantino, the coen brothers, or even david fincher, anderson is a director with his own unique style. these are directors who use the same kinds of camera tints and filters, brand of humor, and color schema. all you have to do is look at a single frame from this movie to know who directed it. but it’s a given that anderson’s movies are artisitic and stylized. the things that really makes the difference are the story and the humor. both of them are pretty good in this film. they are hardly in a league with anderson’s best (rushmore, bottle rocket), but that’s because as this filmmakers has grown and expanded his area of expertise over time, he has also gotten further and further away from his comfort zone. there’s a reason why his first two movies were his best two. they were simple stories set in modest locations. anderson hasn’t done anything on the level of those movies in over a decade. his last film, moonrise kingdom, was the closest thing to achieving the same kind of glory he once had. that movie (like rushmore, his best film), told the story of a boy who acted much more mature, safisticated, and arrogant, than someone at his age had any business of being. that persona is sort of a trademark of anderson’s films, the lead characters who is an absolute jerk and makes no attempt to hide it, not even realizing the things he says sound. just think of owen wilson in bottle rocket, playing a creative criminal wannabe, or gene hackman in royal tennenbaums, always introducing his daughter as his adopted daughter, and pretending his tic tacs were medicine. in the grand budapest hotel, this character is played by ralph fiennes. he is the lead of the film, of course, as the character who embodies this persona always ends up being anderson’s lead (in rushmore there were two characters with these traits, played by both jason schwartzman and bill murray). 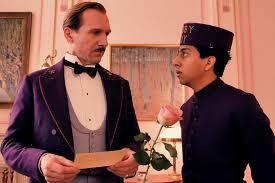 in grand budapest, fiennes plays m. gustave, the man who runs the hotel. he sleeps with much older woman who are guests at the hotel, and isn’t afraid to speak his mind, even when the things he is saying are absolutely awful, or completely blunt. the movie does not begin with this character. in fact, it takes a good amount of time to work it’s way up to him. that’s because this film is told as a story within a story, where we start by being way into the future hearing the perspective of a character who has now aged quite a bit. that character is the jude law author, now being played by tom wilkinson. we head his ideas about being a writer, only to see him as a young man (the law character) staying at the hotel. we now follow law around for a while, listening to his voice over explain observations about the hotel and a man who is also staying there. this man is mr. moustafa. it isn’t until law sits down with him and asks for his story, that we go back in time to see the ralph fiennes character in his story. mr. mustafa is the adult version of zero, the lobby boy who worked under gustave (fiennes). so we have to go back in time from wilkinson to law and then back in time again from f murray abraham (mustafa) to zero, just to get the real story started. it’s a pretty cool, artisitc move. the story is about one of the old women who gustave had an affair with (played by an unrecognizable tilda swinton), dying and leaving a valuable painting to gustave. only the woman’s son, dmitri (played by adrien brody), will not allow this. he now wages a personal vendetta against gustave, to the point where gustave has to steal the painting and then go on the run. he takes his lobby boy with him. there’s a pretty cool adenture story here, including prison breaks, ski mountain chases, and a few run ins with the local police chief (played by edward norton). it’s all a lot of fun, as each character is strange in his own unique way. dmitri, for example, has three sisters who always talk at the same time, saying different things. and then there’s his henchman, played by willem dafoe, as a man of few words, but a lot of violence. as always, the movie is filled with anderson’s crazy brand of humor, such as the use of lots of quick panning or scenes of elaborate stunt that are shot from so far away that they look like drawings in silent movies (think of the ski chase scene and how much it resembles stunts from chaplin or buster keaton movies). also, as usual, the cast is top notch and composed of actors who have worked with anderson before, including harvey keitel (moonrise kingdom), jeff goldblum (the life aquatic), brody (the darjeeling limited), and cameos by owen wilson, jason schwartzman, and bill murray. the movie works for a lot of different reasons. the adventure plot is fun, but it isn’t anything spectacular. i would have preferred to see a movie that took place all in the hotel, and had more of a barton fink element to it’s storyline. still, this is the kind of movie that anderson makes these days. they are his take on an action movie, and this one comes the closest of any of his films to fitting in that genre with it’s hotel hallway shootout at the end. it’s a good movie, and is filled with great humor. this might not be one of anderson’s best, but he’s still amoung the great filmmakers working today, and this movie is still a lot better than most of what’s out there, being put out by everyone else.